KIRKWOOD, MISSOURI – Celebrate Arbor Day and Earth Day during April 2018 by helping the population of street trees grow in Kirkwood! To reach their ultimate goal of planting 1000 trees in Kirkwood by 2025, the citizen-volunteers of the 50 TREES program need your help locating sites for another round of 50 street trees to be planted this fall. 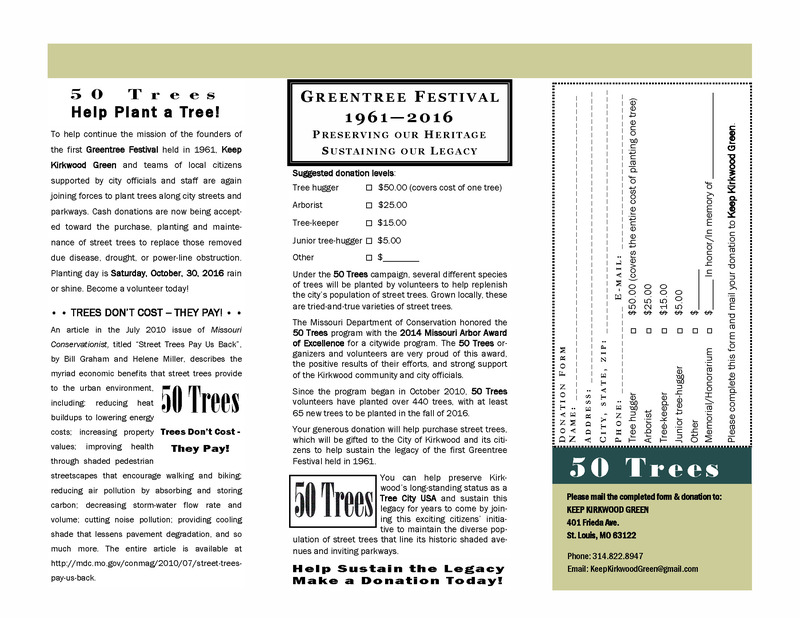 50 TREES was begun in 2010 as a one-off “back to the future” commemoration of Greentree Festival’s 50th anniversary by planting one tree for each year of the festival. This popular, annual event was started in 1961 by citizens as a way to replace the countless trees lost due to Dutch Elm disease that struck in the first half of the 20th century. Fast forward 50 years and we have a new generation of tree lovers wanting to repeat history in the first half of the 21st century by helping replace the scores of trees hit by a new pest, the Emerald Ash Borer. The first 50 TREES program was such a success that it has continued ever since and now with a new goal that is way beyond just 50 trees. To date, over 550 new street trees – oaks, gingkoes, bald cypress, redbuds, hornbeams and more – have been planted to help beautify the streets and lanes in neighborhoods all over town. Residents and business owners are asked to help support this mission by nominating sites for new trees to be planted this fall. Sites must be within Kirkwood rights-of-way approximately 4-6 feet from the street pavement, which typically falls between the curb and sidewalk. Also, sites must be clear of overhead power lines and underground utility lines. Nominated sites will be reviewed this Sept-Oct. Qualified sites will be chosen on a first-come, first-served basis. Trees will be planted free of charge on Saturday, November 3, 2018. Donations are appreciated. Interested in helping create a greener Kirkwood? 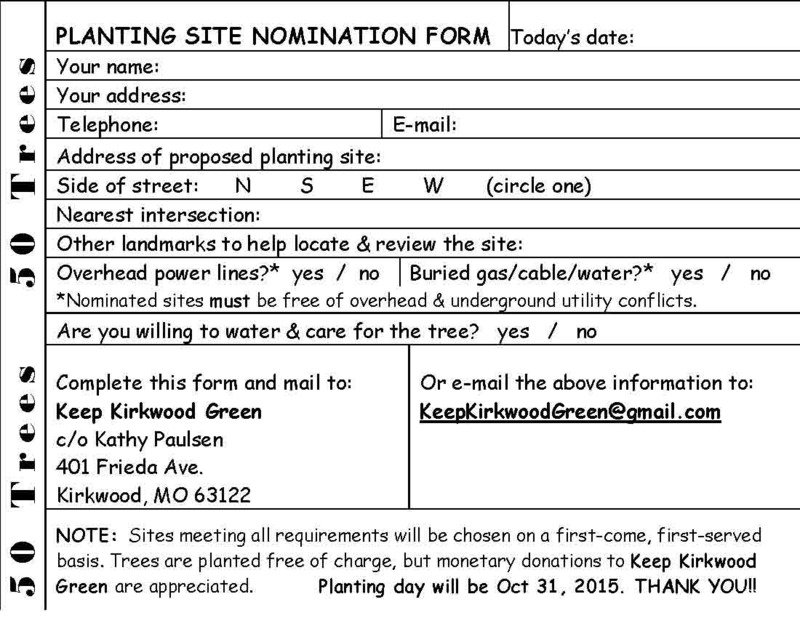 Email your contact info and proposed tree site to KeepKirkwoodGreen@gmail.com, or phone Kathy Paulsen at (314) 822-8947. 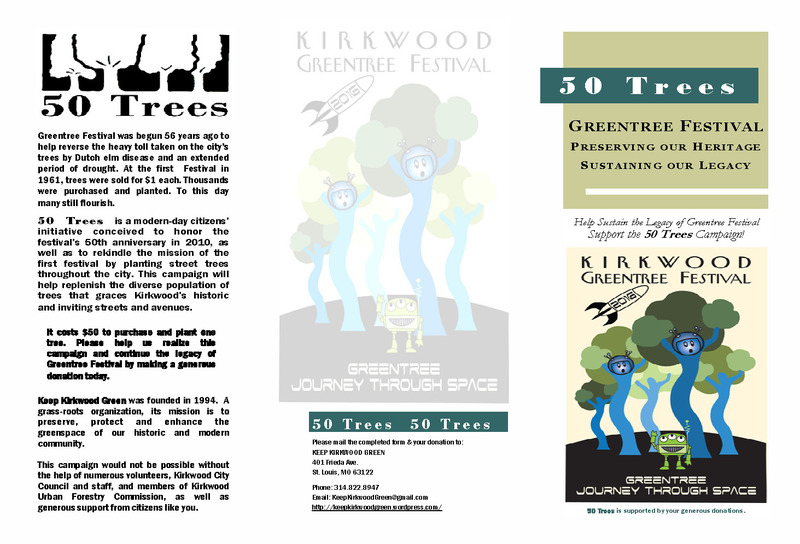 KIRKWOOD, MISSOURI – In honor of National Arbor Day, April 24, 2015, organizers of the 50 Trees street-tree planting program are requesting the help of Kirkwood citizens to nominate sites for trees to be planted this Fall. Initiated in 2010 to honor the 50th anniversary of the Greentree Festival, the 50 Trees program recently received the prestigious 2014 Arbor Award of Excellence for a citywide program from the Missouri Department of Conservation. Plans call for at least 75 trees to be planted this fall, bringing the program’s six-year total to at least 420 trees planted by local volunteers who, through this citizen-led initiative, contribute to Kirkwood’s designation as a Tree City USA for the past 25 years. Nominated planting sites must meet certain requirements. Sites must be within Kirkwood’s rights-of-way – usually in the 3- to 4-foot grassy ‘tree lawn’ between the curb and sidewalk, and the sites must be clear of overhead utility lines and underground utility conflicts. Qualified sites will be selected on a “first-come, first-served” basis. The trees are planted free of charge.